Just because summer is nearly over and the kiddos are back to school doesn’t mean you still can’t enjoy a S’more. 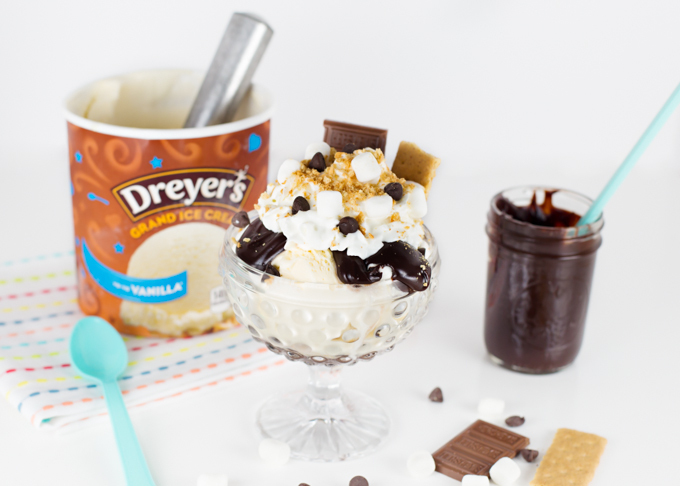 I know, if you’re like me, you think of sitting around a campfire or fire pit on a warm summer evening, but how about enjoying it as a S’More Sundae w/Homemade Hot Fudge instead? 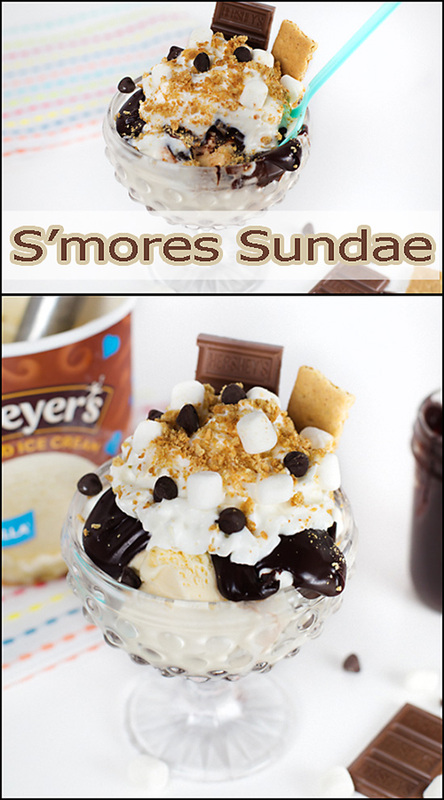 I’m an ice cream lover and could eat ice cream every night (no, I don’t, but I’d like to), so combining a summertime favorite treat, the S’more, with the sundae, seem to make perfect sense. 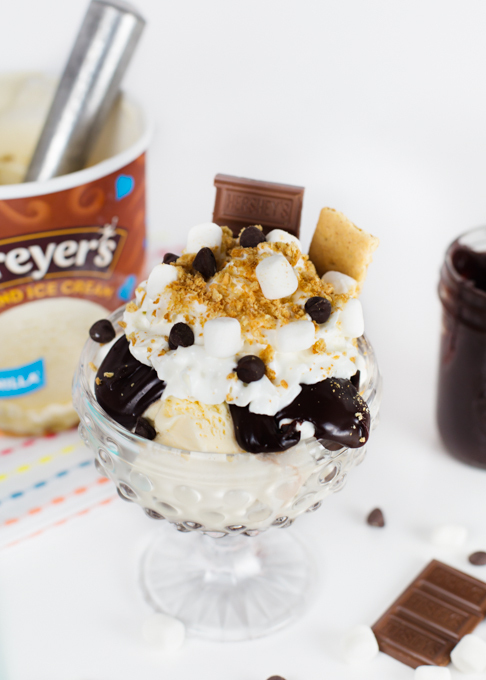 With all the flavors of an outdoor S’more, this sundae is delicious! 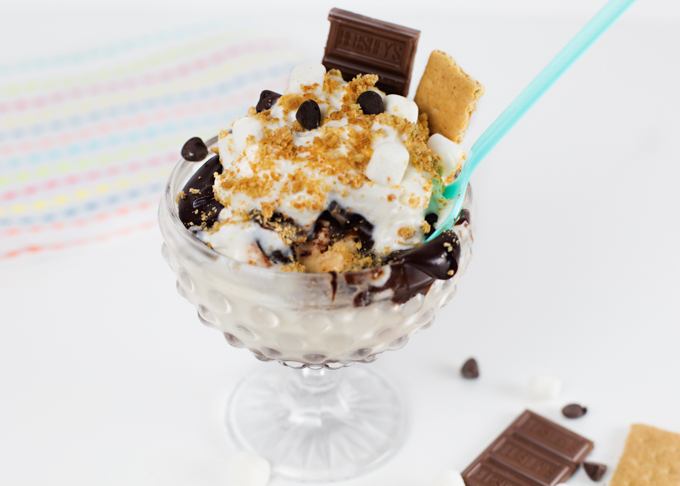 Vanilla ice cream, layered with crushed graham crackers and Homemade Hot Fudge are topped with more hot fudge, whipped cream, mini marshmallows, more crushed graham cracker, and a few mini chocolate chips (just because)! It’s crazy delicious if you ask me! Or, if you prefer, make up a tasty batch of these Gooey Chocolate S’more Cupcakes instead! Either way, I think you’ll be in S’more heaven! In a heavy saucepan, over medium heat, combine cream, corn syrup, brown sugar, cocoa pwd, salt, and half the chocolate chips. Bring the mixture to a low boil, stirring/whisking constantly, until the chocolate chips melt and the mixture is smooth. 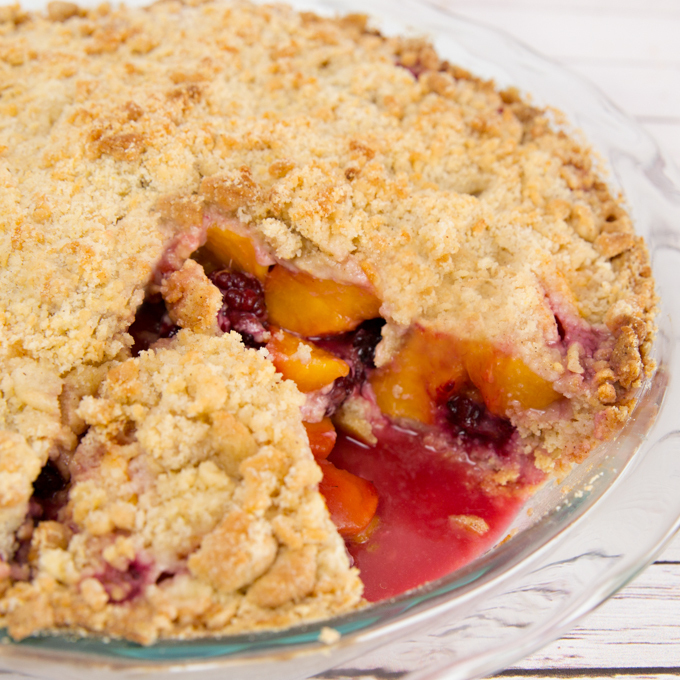 Reduce heat to simmer, and continue to cook for about 5 minutes, stirring often. Remove from heat and stir in butter, vanilla, and remaining chocolate chips. Whisk until melted and smooth. Pour into heat proof jar, such as a canning jar. Sauce will continue to thicken as it cools. Sauce may be reheated, but I recommend only reheating what you'll be using, not the entire jar. Hot fudge recipe adapted from Epicurious. 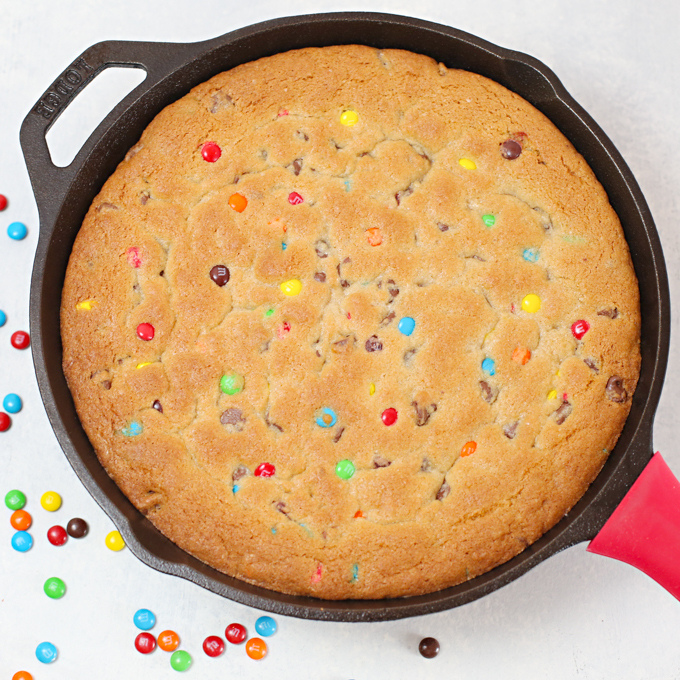 How about trying a Cast Iron Skillet Cookie? 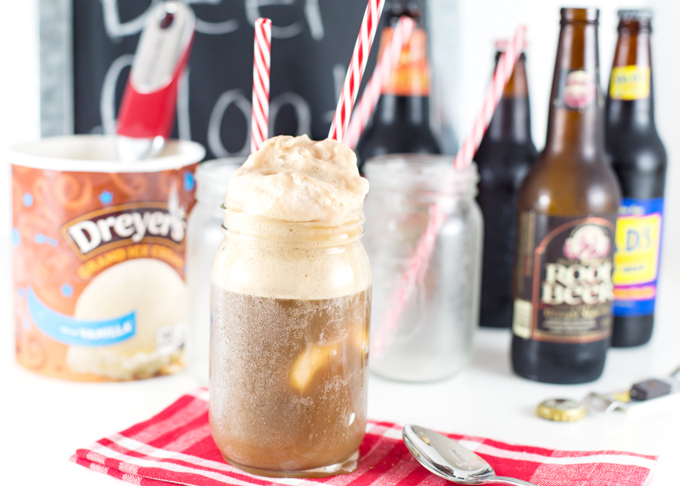 And, of course, you can never go wrong with a simple Root Beer Float! I’ll take ice cream in any form. This looks delicious. I love you pictures. Decadent sundae Renee!!! Pass me two spoons!! !